WooCommerce Coupons Countdown is an extension for WooCommerce, providing pretty coupons with real-time countdown counters. Show your customers the coupons they can use and when they expire. Coupon countdowns showing coupon codes and validity of coupons in real time. 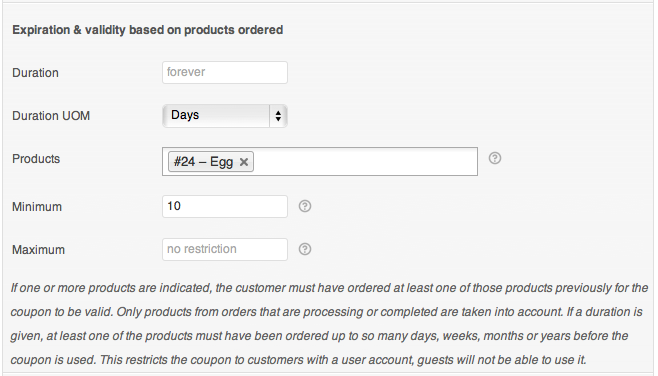 New coupon option for coupons that are valid up to x days, weeks, months or years after a user registers. New coupon option that allows to limit coupon usage per user. Allow coupons to expire based on when a customer’s last order was placed. Coupons can be limited to customers who have purchased certain products. New shortcode that renders pretty coupons in various colors. Coupons can be rendered using built-in attractive styles or using custom styles provided by your own stylesheet. Coupons that expire automatically show a countdown. This works with coupons that have a fixed expiration date as well as with coupons that have their expiration set for a period after user registration. Normal coupons will only show the coupon code. Coupons are rendered only if they are valid for the visitor, this includes coupons for guests and coupons for registered users. Hi, I just purchased your plugin. But i cannot setup expiry date for register user. I am using mailster newsletter plugin which store all my registered users. Could you check why is it not working urgently? Hi Alex, what settings are you using? Hi, I entered the below settings for 2 different coupons. After that i could not apply them in the checkout page. The users tested fulfilled the below conditions. message is coupon is not valid. kindly advise. thanks! Our tests show that under these conditions the coupon validities are evaluated correctly. As this is not an issue with our plugin, you probably have a conflict or an issue in your setup. Try to disable all non-essential plugins – especially other plugins related to coupons and also test with a default theme without customizations. Enable debugging so you can check the debug.log and rule out any errors. I am not a programmer, i do not know how to see the debug.log. could you login to my site and have a quick look and update me please? Sure, please send us temporary admin and FTP credentials to help at itthinx dot com and please make sure to also include a link to this conversation and of course to your site. The FTP access is so we can enable debugging and check for any errors in the debug.log. Hi there. In reading all these posts, is it safe to say that I can add a “one time use” coupon, that “expires on ___ “. Example: “Register by March 1, 2019 and receive a 20% discount, by using coupon code REG3119”. ? Or would I need an additional plugin? Thanks! For the case you describe I think you don’t even need this extension as that should already be covered by the standard options. I’m saying that because you are indicating a fixed date which does not seem to be related to the conditions the extension would cover. Thank you! Would the same hold true if I were to visit “groups” (various throughout time) and tell them “if you sign up by the end of the month, you can get a 20% discount by entering coupon code xxxxx”, and have a coupon code space … and get a log of how many people used that code – for reference? WooCommerce provides a report of Coupons by date which you might find useful for that. I’m not sure about the groups you mention though. We actually do offer a plugin that allows to restrict coupons to group members Group Coupons but I’m not sure if that this is related to what you’re asking. My coupon still able too see even is already expired. how to fix it? Hi, The countdown timer is not displaying correctly on my coupons. The numbers appear in black font and do count down, however, immediately to the right of them (where it should display “days’, Hours”, etc.) it displays a white oval with white font – the words are invisible. I am using a Hespia Child Theme in WP. I would recommend to ask the developer of the child theme for help with the appropriate CSS rules needed to adjust the appearance of the theme. Hi. I don’t think my Coupons Countdown is working properly. With the plugin activated, when I go to Woocommerce > Settings > Coupons, it is only showing the standard Woocommerce coupon options. If I refresh the page, I can briefly see the extra fields provided by Coupons Countdown. My regular theme is Divi, but I have deactivated ALL plugins except Woocommerce and Coupons Countdown, and have tried with stock Woocmmerce themes, but the problem remains. Help with this is appreciated. Sorry I can not replicate this issue. If you send me dashboard admin access to antonio[at]itthinx[dot]com indicating this conversation, I’ll have a look at this. Can’t get the plugin to work for me. Just want to limit the use of the coupon so that customer can only use the coupon one time. you can limit the coupon usage from the “Usage Limits” tabs when you create the coupon. Hi, I’ve just created a coupon which should expire 48 hours after user registration. How do I link these registration methods to the plugin user registration? you don’t need to link the registration with the plugin. When someone tries to use the coupon, then the plugin check when the user was registered. The ‘Guests Allowed’ option doesn’t seem to be working when we set an ‘Expiration after user registration’? In other words, whenever we try to purchase an item as a guest on our website, we get an ‘Invalid Coupon” error message on our website. really both options seem incompatible. If you select Guest Allowed, only guest users can use the coupon, so it makes no sense to have an ‘Expiration after user registration’ value. Hi… I’ve created a coupon set to expire 1 hour after user registration. It shows up for 1 hour correctly, but says “Never Expires”. How do I make sure it shows that it will expire in 1 hour? Your settings seem correct. I can see you have extra options in your ‘General’ coupons tab, ‘Pick Product’s Price’, ‘Auto Generation of Coupon’ and ‘Show on cart/checkout’. Maybe you have another plugin to add these options that is not compatible with our plugin. Please try to disable the other plugin. Unfortunately that wasn’t an option. Its the official “Smart Coupons” plugin by Woocommerce, and its crucial to the site. I was forced to modify that plugin slightly in order to make them play nice. I don’t think its the fault of either plugin, just 2 different approaches to displaying coupons and they aren’t compatible. In case you’re wondering, I created a conditional statement inside the ‘show_available_coupons’ function of Smart Coupons that checks if any of the expiration fields from Coupons Countdown are set. If so, I output the Coupons Countdown shortcode instead of the Smart Coupons default output. I’m glad you found the solution. I’d appreciate if you might share the code to the community. after registering a new account? It depends on where in the process the coupon should be made available. To automatically apply a coupon you can use WooCommerce Volume Discount Coupons. To limit the number of uses per customer you can use WooCommerce Coupons Countdown – it also has an option to allow guests to use it, otherwise the coupon would only be available once the customer has registered and that may or may not apply to the first purchase. Just checking to make sure before I purchase.. I need to set an hour time limit on the coupon after they use it once. Meaning I’d like to set the limits to unlimited, but immediately after the user uses the coupon it expires. We’ve had issues with usage limits causing problems with customers not getting the coupon because the browser failed, etc. So if we remove the usage limits and just set the coupon to expire 1 hour after checkout using the coupon it will negate the customer being able to use the coupon again. So it’s a time limit after the coupon has been used once. I think it does that. Isn’t what you want simply to restrict the coupon to one use per customer? There’s an option for that, see Coupon usage limits per user please on this option. We bought the plugin and I’m setting the usage after purchase to 4 hours but it keeps reverting to 4 days, like the hours won’t take. I’ve logged in and out, and cleared the caches. What do you recommend. You’re right, under “Expiration after last order” it won’t take “Hours” – that’s a bug that needs to be fixed. I’ll review it and issue an updated version to fix this. Thanks for reporting the issue! Great plugin, we’re just having an issue where my boss was testing it in chrome and Safari in the same session , and it was not working with Safari. It was returning COUPON INVALID. What we are trying to achieve is a person receives a coupon in the autoresponder, and they can use it once per customer. We tried this with normal woo functionality, but people kept comlaining that the coupon wouldn’t work so I set the limits to like 4 and 4 to give them enought attempts to get the coupon to work. So then we found your coupon and bought it, and I set the coupon to expire 1 day after last checkout, not realizing that some folks did not use the coupon on the checkout, and when they returned to purchase again the coupon had expired. Also, how do I login and leave a support issue since I’m a buyer? I tried to login and it won’t take. Or do you just want me to leave issues here? For this plugin, posting here is ok. If you just want them to be able to use it once, there is an option for that under Expiration > Usage limits per user. This option is more straight-forward for what you want to achieve and wouldn’t be limited to a certain amount of time. I want to create a coupon whereby anyone who visits the site will have an hour to use the coupon to get the discount. Can this be done? Looking at the questions, it looks like someone else wanted this feature about a year or so ago. you can set a limit time for so many hours, days, weeks, months or years after registering. User need to register to start the countdown. except it apparently isn’t showing now, because it’s expired for all users, even newly registered ones. It must be something to do with the other plugins. Let me know if you’d like me to make you a user account. thanks! Hello. I installed Coupon Countdown on my website and set the option for “Expiration after user registration” for 14 days. When I create test users and log in, it doesn’t seem to recognize the different users – all the users have the same amount of time left on the coupon, regardless of when I registered them. In some cases they were registered days apart. Do you have any advice for troubleshooting? Hi Antonio. I’ve installed it on a dev site here: http://dev.greenbee-web.com/previse/ The user registration is actually done via Gravity Forms User Registration Add-on, if you click through the form here: http://dev.greenbee-web.com/previse/personal-skin-care-consultation/ So it’s not straight WP registration, but it’s been working with UserPro and the other plugins we have set up. If you think this type of registration would be causing trouble, I’d appreciate if you have any ideas of a particular field or setting I could look at to troubleshoot. Thanks! Thanks for the URLs, I’ve created a test account but don’t find any coupon displayed … can you please create a test page showing the coupon you are testing using the shortcode [coupon_countdown code="..."] and let me know when you have added it? I have a questions before buy the plugin: does the option “Coupon usage limits per user” work even if my Woocommerce’s Version is 2.0.20 (and not 2.1)? I highly recommend that you upgrade WooCommerce. Your site may be in danger. Upon successful order, plugin will generate 2 coupons and automatically email them to customer. Coupon 1 is for customer redemption and is one time use with no expiration. Coupon 2 is for customer to share and will have 10 uses before it expires. Email will have custom text explaining coupon usage. Can your plugin accomplish this? Hi Ryan, the plugin is not intended to generated coupons and doesn’t fit the requirements that you have outlined. Thanks for asking! 1) Does the option “Coupon usage limits per user” show a counter to see how many times the coupon is still valid? 2) Does your plugin show a counter to check how many coupons are still available if I print N coupons (with the same code) to be distributed in public? say I print 1000 flyers with the same coupon code and write something like “the 100 first visitors can have a 10% discount with the code XYZ”, I’d like to show a counter on the website such as “hurry up! you are the 99 of 100 coupons available”. No these options are not available but I think they are good suggestions for improvement. I’ll consider these to be added. i have a stock vector website and i sell these vectors on demand. I also want to offer one year coupon to customers who want to subscribe on my website ( subscription is like 3OO€/year ). With this coupon that i will generate for each client, they can download the value of 5O€ max/month for 1 year. I have the idea that coupon countdown could do the work good. Can you confirm me? I don’t think that this will work for you because from what you explain, I understand that you want to limit the monthly access to a maximum of 50$ worth of digital items. The plugin limits the validity of coupons, it doesn’t limit the amount of products you can purchase on a monthly basis. Per my screenshot above I’m using the Usage Limits Per User. That’s what I’m trying to do. But it’s throwing this error message regardless. how is it supposed to behave? Ok now I see what you meant, what happens is that the message is produced by WooCommerce when the coupon is invalid. It’s not something that the plugin itself does. But it gives me an idea for a plugin to customize error messages by coupon 🙂 I’d be happy to have a look if that’s feasible and if it is, then provide you with a beta version for testing. Thanks, ok that’s the plugin’s option. I’ve signed up a test account on the site to have a look. We offer a nutritional supplement with a free bottle to get people to try it. I bought this plugin to limit purchases to one free bottle per user. The problem I have is that if someone has previously purchased, it removes the coupon after someone tries to purchase, and says “this is an invalid coupon and has been removed from your cart”. It would make a lot more sense if the error message said: “Limit 1 per customer. Apologies but this is only valid for new customers” although that’s not ideal either. Which option are you using? It sounds to me as if you’re using “Usage limit per coupon” instead of the “Usage limits per user” option that the plugin provides. Is it possible to have a coupon loaded at the moment someone opens the page for the first time, and have it count down from that point? Yes that would be good to have, isn’t available yet though. Can you make it (happy to pay small fee) or can you give me some pointers as to what parts of the code to call so I can figure it out for myself? That’d be super! Thanks, I think it’s a good suggestion and it would be useful to have it added to the plugin. Can’t promise a schedule but will take a closer look and see if it can be added soon. Honestly, I’d be happy to part fund or something because we need it urgently given where we are with our development plan. Otherwise I’ll have to tie some code together or ask someone else for a hand. So any tips most appreciated! Thanks again! Thanks for the offer, it’s not really a question of funding, rather than fitting it into our schedule 🙂 The feature really makes sense to be added. I would assume that an approach based on a cookie would be suitable, it would just have to be added as an option in the plugin, so that the coupon is checked against when the cookie was placed and base its countdown on that. If you really need it quickly and want to hire someone to extend it, I’d be happy to review and include the extension in the plugin. Your countdown examples show hours and minutes but the feature comments seems to only go down to days. I need a woocommerce plug-in that will allow a coupon to be used for only one hour on a day. Is this possible with this plugin? Thanks for the suggestion, I’ve just added support for hours to the plugin and we’re testing it. The new release 2.3.0 will offer the option to limit it also to hours (the new release will be available this week). Is this available yet? I couldn’t see from codecanyon the latest version / change log or from here. Probably didn’t look in the right area but we’re also looking for hours only. Cheers! Yes that was added in 2.3.0 (changelog.txt is inside the plugin’s root folder). The coupon codes have disappeared since the last round of updates to WordPress 3.8 + the corresponding WooCommerce updates. DEBUG_LOG / DEBUG_LOGGING has not indicated any obvious errors that would impact the coupons. I just pulled down the latest zip from Code Canyon and it appears there are not patches as that is still version 2.2.0. While I wait for an update I am pulling a copy of my current live site over to my staging server in case you need a login. I will email support – at this site if/when a login is requested. 2.2.0 version is fully compatible with WordPress 3.8, so this must not be the problem. Since this is a WP plugin, I expected the download to include a .zip that could be uploaded and installed directly. What I got instead was a file folder full of files and folders that probably live in a plugin .zip (don’t know, since I’m not a coder). Do I need to do my own packaging into a .zip file? Hi Dave, what you download is the plugin as a zip file which you upload directly – you probably have extracted its contents and thus see the files the plugin contains. Simply download the file again, make sure you don’t unzip it and then go to Plugin > Add New > Upload and choose the zip file. Mystery solved – and this may be helpful for others (or perhaps I’m the only one who got caught by this): Safari preferences has a check box to automatically open what they deem “safe” files that are downloaded. This includes zip archives. So if that box is checked, when a zip archive is downloaded, what you see in the downloads folder is the extracted version of the zip, and not the zip itself. And yes, I just recently moved over to using Safari from Chrome and Firefox, so that’s why I didn’t spot this earlier. The plugin is installed and working. Thanks for getting back to me. Thanks for the update, that explains it then 🙂 Please don’t forget to rate the plugin on CodeCanyon! Feel free to post any questions here if you need help. What is the proper forum to use for support for the Coupons Countdown plugin? I’m having trouble with PayPal Express returning an error when a coupon is used at checkout. Hi Larry, this is the right place. What kind of error do you see please? Is it possible to configure the coupon so that it only allows a Product % Discount for one product when their are multiple products in a cart? you need Woocommerce Volume Discount Coupons plugin. Ouch – my previous question about expired coupons has even more urgency. My users are able to use expired coupons. Since once of the coupons I offer is 100% off Version 4 if you have purchased Version 3 within 30 days, this is a huge issue. 1) Users can see the 100% off coupon even after it has expired. 2) Users can ENTER the 100% off coupon and it is applied to their cart even after it has expired. I’m not talking a few minutes expired either, more like 200+ days expired. Contact me via private message here and I can give you access credentials to check this out. I can also setup a mirror system on my dev box and do some debugging if that would help. Ok that shouldn’t happen, maybe a conflict. Please send access to support at itthinx dot com and we’ll have a look what you have there. A mirrored test site would be preferred if possible. I have 2 time-based coupons listed on my product page. They are showing up on the page even if they time has expired. Is there a trick to hiding the coupons if they are expired? I don’t want new users to see them as it will encourage them to wait for another coupon which will never happen. I only am offering coupons for my existing users that are upgrading from major release 3 to major release 4 so no need to show them EVER if they are expired. The WooCommerce Coupon Shortcodes plugin should come in handy 🙂 If you enclose the countdown’ed coupons with the conditional shortcodes I think that should work. I tried that plugin, when the coupon is not valid it makes the remainder of the product page render with blockquotes (pre tag open?). I’ve posted this issue on the WP support forum for the plugin. Thanks Lance, I’ve posted a follow-up there – essentially: I think switching to plain text editor might help because the visual editor sometimes puts tags in there that mess up things. I’d like to create an optin page that captures the subscribers email address and gives them a countdown coupon that starts counting down after their registration is submitted. The part where you grant them a coupon that starts counting down after their registration is part of what the plugin is intended to do, so that one yes. For the opt-in page it depends on what exactly you want to achieve, but the plugin isn’t going to help you with that. If you just let users register on the page, then the coupon countdown will start right after they have registered. For example, you can create a coupon that is valid up to 10 days after registration. I hope that helps a bit 🙂 Feel free to ask if you need more info. I was trying to figure out how to link site registration to my autoresponder email capture form. I want to register the visitor to my woo commerce site and capture their email with the same form. Could I use followupemails extension select user-signup-email type in combination with the coupon countdown? to capture a visitors email, register them to the site and give them a countdown coupon upon a completed registration? You mean the extension from WooThemes? I suppose that should work fine, the Coupons Countdown plugin doesn’t interfere in the registration process anyway, it just bases its calculation on when the user registered. Ah ok, well as long as the user is actually registered, the registration-based coupon countdown will be based on the date of registration. Is there a plugin that will create a woo commerce registration form that I can use as a squeeze page? Could this be created with contact form 7 ? Will any wordpress registration form also register user to woo commerce? Have you checked on WooThemes’ extensions? Thanks for the quick reply. I want to restrict total product quantity when using the coupon but the features of “coupon countdown” are important (ie setting the usage limits per user). Am I right in thinking this “volume discount coupon” and “coupon countdown” can work together to produce one coupon with features of both extensions? yes, you can use both plugins together. I want people to register on the site and then have a once-only use of a 50% discount coupon. This works fine. However, I need to restrict the maximum amount a person can buy when using the coupon and cannot see how to do this. Is it possible? Hi Frank, by maximum amount, do you mean the quantity of products or the $ order amount? If you need to limit the quantity, you might be able to use WooCommerce Volume Discount Coupons. If it’s the order amount by product, the limiting quantity could be derived and you could use that extension as well. Very nice plugin. I am having a challenge creating the following conditions. Can I create a coupon that offers 5% off if they purchase 1 of each item. If more than 1 then coupon should not be valid. This is actually a good idea, I suppose what you want to be able to do is say for example, this coupon is valid if you have purchased at least 10 units of that product in the last three months, this other coupon is valid if you have purchased between 2 and 9, and this third coupon is valid only if you have purchased one unit. The only thing that’s missing for the plugin to be able to offer this, is a couple of options with a minimum and maximum amount of units purchased on the ‘Expiration & validity based on products purchased’ panel. I’ll add these and release an updated version, you should see it within a couple of days. Thanks for the suggestion, I think this is going to be quite useful! Thanks for considering the update for guests. Any idea on when that might be added? Will definitely rate on Code Canyon as we are finding great uses for this plugin. Hi Jason, the update has just been released, please give it a try. There are other new options that you might find interesting as well, including the possibility to limit based on last order purchased and products purchased. I purchased the plugin and the option “usage limite per user doesn’t work”. A couple of users have already used the coupon more than once. Please notify me when you fix this and a new update is available. Thanks in advance. Can you please detail what coupons and settings you are using and also a link to the site so we can have a look please? Well, in the general settings I entered 5.00 as Cart Discount, checked “Individual Use”, entered 200 as “Usage Limit”, and set an Expiry date. Then I installed your plugin and only entered 1 as “usage limit per user”. But then a user used the coupon twice (separated orders); so I tested myself and in fact I can use the coupon more than once. Your configuration looks correct. If you want you can send us dashboard admin access to support at itthinx dot com and we’ll have a look. We purchased plugin and works well. I’d like to set a usage limit of 1 for non logged in users (guests) to the site. My goal is to get the coupon to expire after one use for both guests and users. Many thanks Jason, it’s great to hear that. Regarding a limit for guests, I’ve been considering this already and will provide that option in an update – give it a few days please until the update is tested and released. i want create a lot of code coupons on same times, “WooCommerce Coupons Countdown” can do that? and how to do that? 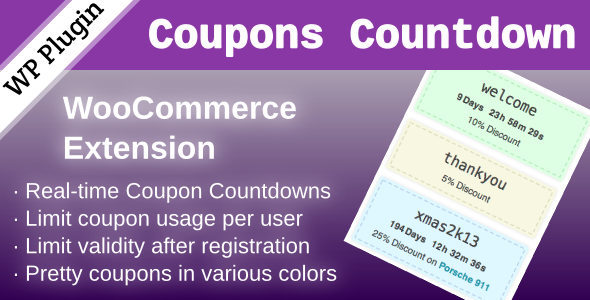 Hi Jang, the plugin provides countdowns and other features but not bulk coupon creation. I would like to make a coupon with countdown for online users. I would like to make a coupon with countdown for OFFLINE users. Go to Coupons > Add Coupon and call it example, under Expiry date choose a date. The coupon will display the countdown for all visitors, independent of whether they are logged in or not. yes, the coupons appear when the user is connected. Hi, I bought Countdown WooCommerce Coupons by Codecanyon. Coupons can not be seen when the user is not logged in, this to me is a problem. In next update is possible for a non-registered user can see the coupons? The coupons should show up even when the user is not logged in, unless there is a restriction for the coupons to registered users only. Can you provide a link to the site so I can try it out please?